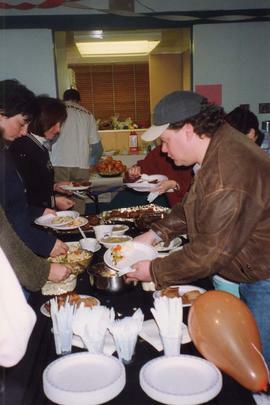 Photograph depicts people at a food table. Photograph depicts children eating apples and honey. Photograph depicts children eating hamantaschen. 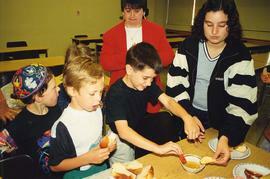 Photograph depicts a group of children and Susan Katz eating. Photograph depicts a group of children and an unidentified woman eating challah, apples and honey. Photograph depicts a group of children and unidentified woman eating. Photograph depicts a group of children around a table with candles, challah, apples and honey. Photograph depicts a group of children eating challah, apples and honey. Photograph depicts a group of children watching one child eating challah and honey.